Representing two-thirds of the world’s population, the participants range from burly, hairy heavyweights specialising in Kurash (a form of Uzbek folk wrestling), to eSports athletes a fraction of their size. The Games, which take place every four years, begin on Saturday – but who and what will they involve? While the Olympics hosts slightly more participants, the Asian Games overshadows it with complexity and variety. It comprises 40 sports, with the full Olympic programme joined by more regional interests and left-field choices. Sepak takraw – a kind of keepy-up volleyball featuring spectacular helicopter bicycle kicks and a small wooden ball. Paragliding – the sport is making its debut with events in the cross-country and aerobatics disciplines. Pencak silat – a traditional Indonesian martial art featuring the use of various stick-like weapons. Rollerskating – athletes will compete in a 52-lap 20km race, with the field gradually whittled down to a final eight to compete for medals. Sport climbing, Skateboarding, Karate and Softball – all appear here before they make their debut in the Olympics at Tokyo 2020. Bridge – the card game is the fourth ‘mind’ sport to appear at the event after chess, go and xiangqi featured at previous editions. eSports – the sport has exhibition status before it becomes a full-medal event at the 2022 event in the Chinese city of Hangzhou. Players will compete in games such as League of Legends and Pro Evolution Soccer. While some of the sports may be unfamiliar to those outside Asia, not all the names are. 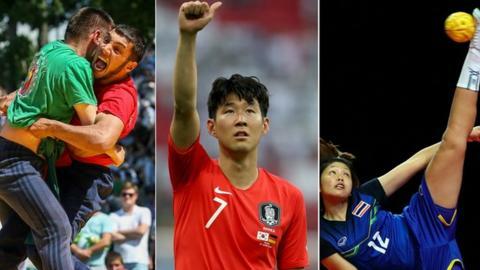 Tottenham agreed a deal with the South Korean Football Association to release playmaker Son Heung-min for the event in the hope that his team can win the tournament and earn him an exemption from the usual 21 months of military service expected of his countrymen. The South Korea team that won the 2014 Asian Games had their obligation reduced to four weeks of basic training. Son, 26, missed that tournament after former club Bayer Leverkusen refused to release him. The expectation in South Korea is for men to start their military serve before the age of 27. Jordan Clarkson – who plays for NBA side Cleveland Cavaliers – was initially refused permission to travel to the tournament to represent the Philippines. The 26-year-old, however, convinced officials to change their mind and is now bound for Jakarta. Three-time Olympic swimming champion Sun Yang and sub 10-second 100m sprinter Su Bingtian are both in China’s team. Malaysian squash great Nicol David will attempt to win a fifth individual gold while badminton world number one Kento Momota is representing Japan. Stand-in host for a stand-out Games? The Indonesian authorities will hope the star names, rather than the host nation, make headlines. Three months ago Indonesia suffered its deadliest terror attack in more than 10 years, when suicide bombers killed 13 people in Surabaya, the nation’s second-biggest city. As many as 100,000 police and soldiers are being deployed in Jakarta, with the same number again on standby. The country’s Deputy National Police Chief Muhammad Syafruddin claimed a radical group with plans to attack the Games had been foiled in recent months. Indonesia took on the Games after Vietnam baulked at the costs involved and withdrew as hosts in 2014. Much effort has gone into improving infrastructure in notoriously congested Jakarta, with a landmark light rail system opened in time for the event. The capital and the South Sumatran city of Palembang have been cleaned up for the Games, although an attempt to hide a foul-smelling waterway – known locally as ‘Black River’ – beneath nylon mesh has attracted criticism.